A lot of the times, when we watch a MV, we notice what is on the screen—what’s there; who’s there, what they are doing; the colour scheme; and so on—in short, to use film language, the mise-en-scène. We tend to pay less attention to cinematography—how the images on the screen are shot and framed. Camerawork can be a subtle but very effective way of influencing the visual experience, and breaking it down often tells us what position the MV constructs or imagines for the viewer. A key strength of Astro‘s concept and placement in the saturated K-pop scene lies in Fantagio Entertainment knowing their material. The group’s cheerful music and energetic performances tap directly into their skills, their young age, and the members’ beagle-dol, sunshine personalities. 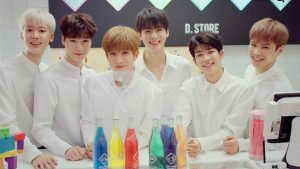 It’s not that Astro embody a new or perfectly original image, but that they’ve been marketed with a concept that fits them to a T. The result is an undeniably charming synergy in which their personalities feed into their music and performances, and their songs and dances bring out their personalities. As they generated interest and cemented Astro’s image through the four seasons project (Spring Up, Summer Vibes, Autumn Story, and Winter Dream), Fantagio concurrently made efforts to secure Astro’s fanbase. Unlike some companies (or I should say SoMe) that took as long as 7 years to confirm an official fandom name for their artist, Fantagio wasted no time at all: Astro announced their fanclub name, “Aroha”, during their debut showcase. And while rookie K-pop groups tend to promote domestically or in Japan in earlier years, within 13 months of their debut, Astro brought their showcase to parts of Southeast Asia as well, like Indonesia, Bangkok, and Singapore. 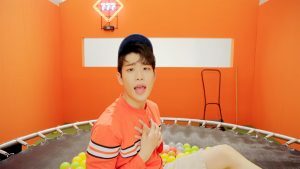 These moves are indicative of Fantagio Entertainment’s awareness of the importance of fan marketing. The company seems equally precise about what demographic they are targeting with Astro’s fan marketing. We see this in the choice of female protagonists for their four season project MVs: the uniforms that the “Hide & Seek” and “Confession” female leads wear suggest they are in high school, and while Choi Yoojung in “Breathless” isn’t in uniform, she belongs to a similar age range. Despite the slant towards the target demographic, the MVs, particularly “Hide & Seek” and “Breathless”, were crafted in a way that opens the group’s appeal to a broader audience. They offered the message that Astro are there to cheer listeners up when life is dreary or hard; their music is refreshing like chilled soda in the summer. “Confession” appeared to carry the same theme, with Astro as fictional manga characters come to life; they follow their creator in her dejected post-breakup state and keep her company. However, the ending ultimately casts them in romantic terms by showing Eunwoo in tears, wanting to confess but being unable to because they have no avenue of direct contact with her. This pushes the group more explicitly into the well-traversed boyfriend-dol territory, encouraging fans to identify with the female protagonist, imagining themselves as possible recipients of Astro’s confession despite the distance sustained between Astro and them, as represented by the unbridgeable gap between the girl’s world and Astro’s. “Baby”, featuring a “dream store” run by the Astro boys, builds on this shift towards fanservice. The protagonist is no longer a proxy female character on-screen, but the viewer behind the camera itself. The camerawork makes clear that it represents the viewpoint of a fan living out her fantasy, albeit a very chaste one. (While it’s true that there is no indication of who is assuming the camera’s perspective, because heterosexual relations are more often than not the default point of reference for K-pop, I am proceeding with the female pronoun.) The fan-viewer, as I shall refer to this particular construct of a spectator, is co-opted into the happenings on-screen, in the way a first-person role-playing game is designed to create the illusion of the player experiencing its scenes directly. We follow the perspective of someone peeking shyly at the D.Store from behind a shrub; Eunwoo, who is opening up the store, notices and comes over, reaching his hand out with an encouraging smile and nod. The camera tracks past the members as they prepare to start their shift; the montage of scenes is not unlike what the first customer of the day might encounter. In a literal fanservice moment, the fan-viewer is served her drink—a purple one, corresponding to the Aroha official colours—which she sips as the Astro boys huddle at the counter, observing her. The fanservice aspect is emphasised by how the viewer is the only customer in the store, and she receives the undivided attention of all six boys, sustaining the illusion that she is engaging in a personal interaction rather than being just one of many recipients of fanservice. A sip of the purple soda zaps the fan-viewer into a fantasy world within the fantasy D.Store. She finds herself in a series of single-coloured sets, with one colour of the rainbow assigned to each member; according to fans, the colour selected reflects their personalities. 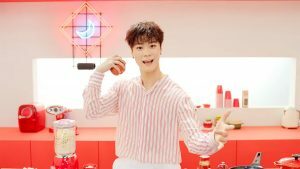 In a red kitchen, Moonbin catches an apple thrown by the viewer and munches on it; Sanha strums on his guitar in a yellow set; Eunwoo tries to compose something in a blue room; Jinjin dribbles a basketball in a green room; MJ‘s set is orange with a trampoline; and Rocky dances in an indigo ring. 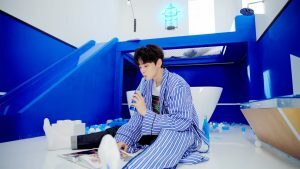 The return of parallels between the members and soda bottles, seen in shots of them posing with bottles that match their colour, is a fun nod back at the “Breathless” MV. It also ties in with the interesting sound effect—of a bottle being opened and fizzling—that kick-starts the song. The use of the rainbow here follows in the vein of Astro MVs, which take a simple idea and use it in an unusual way. 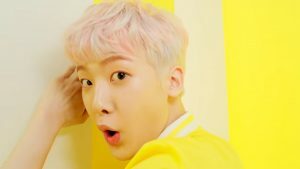 “Baby” may not match the earlier MVs in levels of creativity and delightfulness, but it has interesting touches in how certain shots are linked: the yolk of the egg that Moonbin cracks into a pan serves as a visual link to Sanha’s yellow set, and Sanha turning back with a startled expression is matched by Eunwoo sitting up in shock. 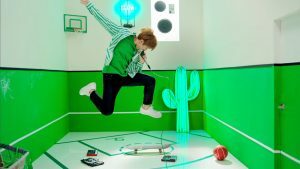 Because of their bright and cute image, Astro’s dance skills are not often the first thing viewers would notice. Fortunately, the lessened emphasis on narrative and a heavier focus on choreography shots in “Baby” ensure more attention is given to the dancing, reinforced by Rocky’s solo dance cuts. The dynamism of these dance cuts and the variation of colours suit the song well, with its flute-like tropical synths piping along between snaps. The melody line is kept simpler than their previous title tracks; it neither soars nor bursts with energy, but it is infectious enough to have you bopping along. The dual concept underpinning “Baby”—colour-coding the members and framing the MV as fanservice—is a reasonable move calculated to appeal to existing fans, while also helping new fans identify individual members. However, there is a sense that the MV could have been richer in its execution of the dream store idea, or could have had more potential to reach out, if it had not taken this fanservice angle that assumes what a fanbase of a certain age and gender demographic wants. It probably won’t cause Astro to loose fans, but if this is the first contact a casual viewer has with Astro, the fanservice angle risks selling Astro short as yet another boy group being marketed as young, single boyfriend-dols. Granted, there could have been worse directions to take for developing a boy group’s image, such as sexualisation or male violence masquerading as maturity. And as discussed earlier, Fantagio Entertainment has done a great job of selecting Astro’s concept. They’ve also been promoting the group at regular intervals, with not more than three or four months between each cycle. It’s certainly not the case that Astro can’t pull off fanservice winks, smiles, and other gestures either. But these boys are talented, skilled, and exude a natural, bubbly charm; as earlier MVs have proven, they don’t need to be partaking in fanservicey acts to capture hearts. So here’s hoping that the second part of the “Dream” project brings a better take on the dream theme.